In their first internationally-available live recording , after a quarter century playing together, the String Trio of New York is expert at telling it like it is — straight from the gut — particularly in live performances. Recorded live at New York's prestigious Jazz Standard , the groundbreaking group which the New York Times describes as "refreshingly uncategorizable" premieres three new suites of music , including one by trumpeter and composer Dave Douglas . Gut Reaction is also the S3NY recording debut of violinist Rob Thomas , whose ambition it has been to play with the String Trio ever since hearing their first recording over twenty years ago. The String Trio of New York invented a new "sub-genre" of music with its distinctive fusion of creative jazz and classical music and its violin-guitar-bass instrumentation . After 25 years of making music around the world, the S3NY still delights jazz, new music, and "new classical" music fans with their vibrant, energetic playing and charismatic, vividly picturesque compositions. They "cut loose" with style on their OmniTone debut. 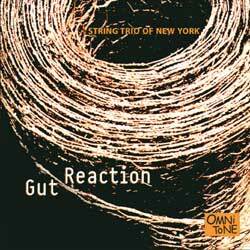 Buy Gut Reaction now at the OmniTone store. James Emery's compositions are published by Jamem (ASCAP). John Lindberg's compositions are published by Lindy Publishing Company (ASCAP/SACEM). Dave Douglas' compositions are published by Noenmity Music (BMI). Visit the String Trio of New York's website.